Bairro Alto is an area of pretty cobblestone paths and ancient buildings. Its bohemian and artsy atmosphere makes it irresistible to young property buyers, who are drawn to its lovely old houses and apartments. 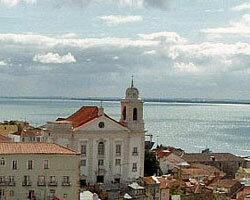 The district has been around since the 16th century. Sao Roque Church, also dating from that time, is the oldest Jesuit church in the country and in its interior is a magnificent display of baroque architecture and ornamentation. The ruins of Carmo Church, which had been destroyed during the Great Lisbon Earthquake of 1755, are fascinating. The Gothic arches along the nave remain, but the roof is gone and visitors can look up at the sky as they walk through the ruined church. The commercial streets of Rua do Norte, Rua de Atalaia, and Rua do Di rio de Noticias are quiet during the day, but transform into the centre of Lisbon's vibrant nightlife at sunset. In fact, it might be difficult to get an early night's rest in Bairro Alta. The district has an exuberant party atmosphere enhanced by the excellent restaurants peeking from behind colourful, graffiti-ridden facades, and famous fado houses. Chic alternative fashion boutiques open till late into the evening and numerous trendy bars keep the area busy very night of the week. Bairro Alto is not without its problems. Vandalism and drug trafficking are especially dire ones that the district has been trying to deal with for years. Prostitution, which once plagued this area as well, has been successfully halted.